Enjoy the best of hillside living at Crystal Nai Harn. With its peaceful ambience, stunning island views and immaculately furnished interiors, the villa stands out as a prime property in Nai Harn, and is highly recommended for friends and families seeking a restful getaway in Phuket. 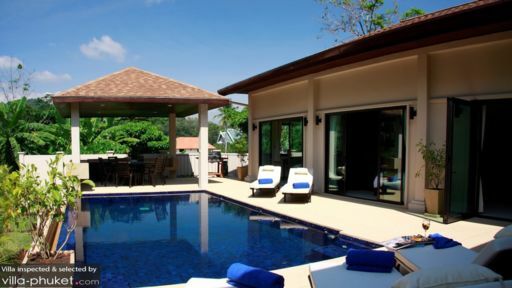 Crystal Nai Harn houses a total of nine guests in four bedrooms. 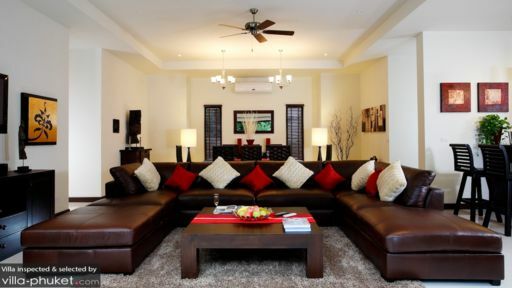 Like the common areas, each of the bedrooms feature theme colours of cream, a dark teak brown and splashes of red. Laid out around the deck, all bedrooms offer easy access to the pool and garden. The generously proportioned master bedroom is kitted out with a king poster bed and capacious en suite with shower recess and bathtub. Each of the three guest bedrooms feature a different bed configuration; the first contains a king bed, the second has twin singles and the fourth has a bunk bed combining a queen bed and single. The first and second guest rooms share a bathroom, while the third features a private en suite. Make a splash! A sparkling swimming pool invites vacationers to cool down from the heat with a refreshing dip. 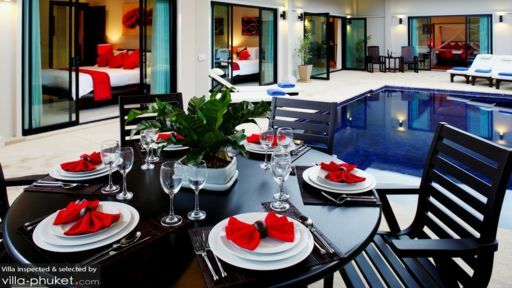 Surrounding the pool are recliners and an outdoor sala kitted out for al fresco dining. A neatly manicured lawn extending out from the pool deck is ideal for outdoor yoga sessions or sports games with your little ones. Crystal Nai Harn’s living spaces are awash in colours of soft cream and dark brown, with pops of vibrant red serving as an accent colour. A beautiful selection of art works, dark wood fixtures and hanging lamps adds on to the home’s elegant ambience. The indoor lounge is spacious and inviting, with a plush sofa set that wraps around a coffee table, TV with DVD player, iPod dock and game console. The room flows out to a dining area furnished with an eight seater set, and a fully equipped open kitchen with breakfast bar. Housekeeping services and welcome drinks are included with your stay. Kid-friendly amenities available include a baby cot and pool fence. Babysitting services, daily breakfasts and in-villa chef or massage services are available at additional cost. Located in Nai Harn, south Phuket, Crystal Nai Harn offers a tranquil environment ideal for a relaxing family holiday. It’s also within easy reach to the beach, restaurants and local amenities - a plus point for parents travelling with young children. The serene coasts of Nai Harn are about three minutes’ drive from your villa. Quiet and remote, it’s ideal for sunbathing and beach strolls. Head down further south and you’ll wind up at the beaches of Ya Nui or Ao Sane. Both sites offer exceptional snorkeling, and are about seven minutes’ drive from your villa. Located up north, about 16 minutes’ drive is Kata Beach. The vibes here differ from the ambience down south - an array of dining and nightlife venues lining the coast gives Kata a lively atmosphere. Unlike Patong, the nightlife scene isn’t raucous, making it well suited for families. Dining establishments located nearby include Mom’s Tri Royale and Bistro Mon Ami. RE KÁ TA, Ska Bar or Heaven Rooftop are our favourite sundowner spots, while Rum Jungle Cafe is a great bet on days where you’re in the mood for relaxed, fuss-free dining. These venues are between five to 15 minutes’ drive from your villa. We stayed with extended family for four too short days in October. The Villa is clean, beautifully decorated and furnished and has the most gorgeous pool.